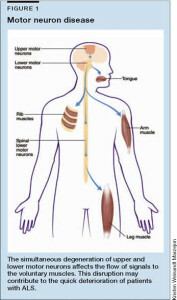 ALS, Amyotrofic Lateral Sclerosis (or MND, Motor Neuron Disease). This condition is also known as Lou Gehrig’s Disease, because of the famous baseball player who suffered from the disease, giving it greater publicity. Amyotrofic Lateral Sclerosis is a neuromuscular disorder, in other words, a disease of the nerves and muscles. The exact cause of ALS hasn’t been determined yet – which is why so far, it can’t be cured or even brought to a standstill. Currently, two different groups have been classified: familial (or genetic) and sporadic ALS, where no hereditary element seems to be involved. Approximately 5 to 10 % of the cases have a genetic cause. ALS is a progressive disease. This means that patients with this condition deteriorate, often relatively quickly. Nowadays, it is possible to slow the process down slightly, using medication and therapy. People move using their muscles. In order to do so, our muscles receive signals from the brain by means of the nerves. In ALS, the motor neurons connecting the brain to the muscles, and controlling voluntary movement, slowly degenerate. Once the neurons die, they no longer send messages to the muscles, which in turn causes them to atrophy and become unable to function. Eventually, the brain no longer has any control over the body at all. In general, the disease is not painful, and mental faculties remain normal in most cases. There is usually no impairment of the senses (touch, taste, sight, smell and hearing remain intact), and bowels and bladder remain functional. However, all of the muscles except for the heart muscle will be affected eventually. As the disease progresses, the patient will be more and more limited in his movements. In most cases, the cause of death is failure of the respiratory muscles. The rate in which people who have been diagnosed with ALS deteriorate varies, but in general life expectancy is no more than 5 years. ALS is most commonly diagnosed between 40 and 60 years of age. o The inability of the motor neurons that connect the brain to the muscles to transmit messages to the muscles, which in turn causes them to atrophy and become unable to function. o The limited ability to move once the disease progresses. o Risk of failure of the respiratory muscles. • It can strengthen unaffected muscles. • It can enhance cardio-circulatory health of the muscles that are losing function. • It may help patients fight fatigue and depression. • It can help in preventing painful spasticity and shortening of muscles. • It can help maintain bodily functions. As the muscles are stimulated directly, no activation by the central nervous system is necessary. This makes it possible to train the muscles without the necessity of any voluntary or involuntary signals from the brain. In all probability, this will not lead to functional recovery, but it does affect the occurrence of spasticity and improve circulation. Results will vary for each individual patient, but as there is a very limited chance of a negative impact, exercises on the Power Plate machine are definitely worth a try. Don’t allow a patient to train without previous consent of a doctor or specialist. It is imperative that ALS patients are trained by people who have experience in working with these patients. We strongly advise patients to seek the assistance of a physical therapist or someone with a medical background. NOTE: These are “suggested” protocol by users of Power Plate® machines not necessarily endorsed by Power Plate Inc. Use at your own risk and Consult your physician.